architectural ruminations: "Welcome to St. Louis"
These views of entry points to St. Louis when crossing the Mississippi reveal the architectural and urban problem faced by the city in trying to welcome visitors from the East and to establish St. Louis as the "Gateway to the West". The caption of the first image (Illustration Number 23) reads: "The St. Louis entrance to its new $7,000,000 Municipal Bridge, looks like the approach to a frontier town." 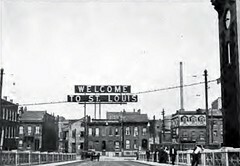 The link offers a Google Maps view of the "new" bridge (from 1917) located South of the Poplar Street Bridge. 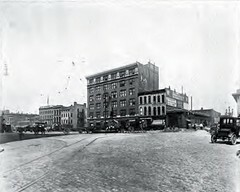 While cars have been banned from using the structure for years, trains still regularly cross the Mississippi using it. As a graduate student working on a studio project located in Chouteau's Landing, I climbed a fence and walked to the center of the span. I carefully walked around the busted out asphalt and concrete road deck and took some panoramic shots of the city. I was then startled and shaken by a train crossing the bridge on the lower level at a fairly high velocity. I wasn't clear I wouldn't end up in the river along with my camera. The caption reads,"Illustration No. 22. -- The lack of attention given to the few bridge entrances in St. Louis is really surprising. These gateways to the city should be made to convey a more characteristic impression of a great city. The large plaza at the entrace to Eads Bridge, shown here, could be greatly improved." This view at the end of the Eads Bridge is denser, more congested, and more disorderly than the "new" southern entrance to the city. This is the condition of the only non-river entry for many people for many decades. The Eads Bridge similarly provided vehicular and rail traffic. The rail lines at the St. Louis end of the Eads Bridge proceeded underground into the city in a manner similar to the existing Metrolink tunnel access. Interestingly, the Poplar Street Bridge was not in existence at the time of the Jefferson National Expansion Memorial Competition in 1947 and the Eads and Municipal Bridges framed the site. These views are taken from Harland Bartholomew's Problems of St. Louis, The City Plan Commission, St. Louis, Missouri, 1917. My thanks to the St. Louis Brick website for directing me to this publication. Thanks for posting these great photos. Unfortunately the entry views to our City have changed for the worse over the years. While the vista of the Arch and the Downtown skyline are great, but the endpoint of each bridge leaves much to be desired. If the Municipal bridge were still open instead of a welcome sign and a bustling dense city, you would be greeted by the blank black glass wall of one of Purina's buildings. The at the end of the Eads Bridge you are greeted by the oppressive elevated lanes of I-70. Same with the MLK with the added lovliness of the cooling towers for Lumiere Place... $400+ million and that was the best they could do? Sadly, the crowded PSB probably offers the best views as the unobstructed skylines passes to the right.